Maxwell Gordon Lightfoot, the second son in a family of five children born to his father, William Henry Lightfoot (1852-1898), an insurance agent, commercial traveller and pawnbroker, was born in Liverpool on 19th July 1886. His mother, Maxwell Gordon Lindsay (1858-1946), was the daughter of a sea captain. According to the Tate Gallery: "His mother had acquired her unusual name on the wishes of her sea captain father who prior to being lost at sea during a voyage and, expecting a boy, had left instructions that the baby should be named Maxwell Gordon. The name was bestowed upon the newborn in his memory despite the fact that she was a girl." When he was a child the family moved to Helsby in Cheshire. At the age of fifteen, Lightfoot begun his training in art at Chester Art School (1901-1902). In 1905 the family moved back to Liverpool and became an apprenticed chromo lithographer at the printers, Turner and Dunnett. Lightfoot also attended evening classes at the Sandon Studios and studied under Gerard Chowne (1875-1917) and James Herbert McNair (1868-1955). In the autumn of 1907, Lightfoot, following the advice of Gerard Chowne, he moved to London to study under Henry Tonks at the Slade Art School. He made friends with a group of very talented students. This included C.R.W. Nevinson, Stanley Spencer, John S. Currie, Mark Gertler, Edward Wadsworth, Adrian Allinson and Rudolph Ihlee. This group became known as the Coster Gang. According to David Boyd Haycock this was "because they mostly wore black jerseys, scarlet mufflers and black caps or hats like the costermongers who sold fruit and vegetables from carts in the street". C.R.W. Nevinson argued in his autobiography, Paint and Prejudice (1937): "We were the terror of Soho and violent participants, for the mere love of a row... We also fought with the medical students of other hospitals... There is no doubt we behaved abominably and were no examples for placid modern youth." He also commented that the Coster Gang was "a crowd of men such as I have never seen before or since." 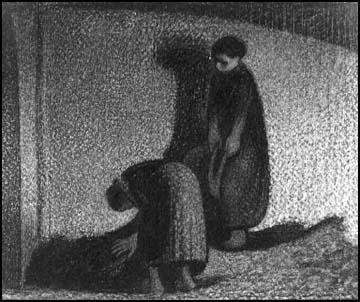 Nevinson also wrote that Gertler was "the genius of the place... and the most serious, single-minded artist I have ever come across." Mark Gertler was considered the best draughtsman to study at the Slade since Augustus John. Despite the high standard of competition, in 1909 Lightfoot won the Melville Nettleship prize for Figure Composition. Gail Engert has argued that Lightfoot's paintings were influenced by the work of Stanley Spencer: "In terms of quantity, of variety of production, and increasing maturity of style, 1910 was the most important year of the artist's short life. From this year date the slightly macabre sepia illustrations which, with their emotional overtones, their mannerisms approaching the grotesque, and their strong chiaroscuro, are close to the works by his friend, Stanley Spencer.... Many of Lightfoot's numerous tree studies, probably also of this year and done in the same brown ink medium, also have a sinister quality in the way the dark trees are silhouetted, despite being pure landscapes." 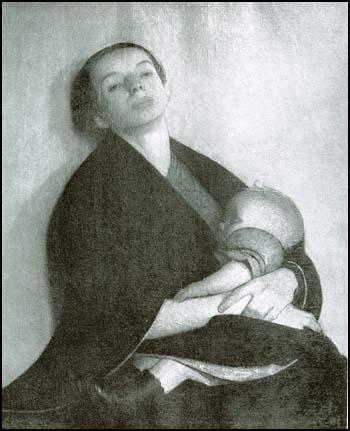 According to one critic: "On leaving the Slade in 1910 Lightfoot formed a reputation as a talented painter with an idiosyncratic style and subject matter. He generally painted atmospheric pastoral landscapes and stylised figure compositions, drawing in pen and ink and watercolour as well as painting in oil. He became particularly fond of the effects of brown ink, creating dramatic, slightly sinister sepia illustrations of figures or trees... The theme of mother and child came to dominate his art and he produced a number of paintings of this subject which are sensitive and well observed portraits." In February 1911, Lightfoot exhibited with C.R.W. Nevinson, Mark Gertler, Adrian Allinson, Vanessa Bell, Duncan Grant and Rudolph Ihlee at the Alpine Club Gallery in Mill Street, Mayfair. Lightfoot and Gerter were singled out for particular praise. He then joined forces with Augustus John, Percy Wyndham Lewis, Walter Bayes, Walter Sickert, Harold Gilman, Henry Lamb, Spencer Gore, Lucien Pissarro, James Manson, Robert Bevan and Charles Ginner to form the Camden Town Group. In June he showed four works, Mother and Child, Boy with a Hoop, On Luddery Hill and A Child Playing with a Ball. Lightfoot received a good review from The Morning Post: "Lightfoot's powerful drawings suggest that, unlike his fellow "wonders" he is going to compromise with the past. His two oil pictures are carried further in the old-fashioned sense than anything in the gallery. He is obviously not going to remain satisfied with the light, rather precarious painting of the Camden Town Group". The Times reported: "Without any undue or dangerous precocity Lightfoot had mastered his medium. He had little in common either with the sentiment or the peculiar methods of the Camden Town Group; indeed it was a matter of general surprise that he should be showing his work with theirs." Another critic argued that his work seemed to be "unrelated to his fellow members, and Mr. Lightfoot's exhibits prove him quite able to stand by himself." Lightfoot took their advice and after the exhibition resigned from the Camden Town Group. 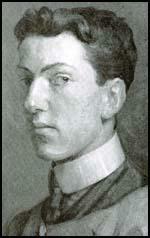 On 27th September 1911 Lightfoot planned to travel with Lilian Kate Thompson to Liverpool to meet his parents. However, that morning their was a disagreement and he cut his throat with a razorblade in his 13 Fitzroy Road lodgings, in Primrose Hill. His friend, C.R.W. Nevinson argued that he was struck by the callous attitude of his friend's bereaved fiancee: "I felt bewildered when I witnessed the natural pride of the woman because a man had died for her." The inquest passed a verdict of "Suicide whilst of Unsound Mind". Despite the fact that he was preparing for an exhibition of his work to be held at the Carfax Gallery, no paintings were found in his studio after his death and it is possible that Lightfoot destroyed them all before killing himself. On announcing his death, The Times claimed that: "All artists and critics.... were united in believing that Lightfoot would enjoy a most distinguished career in the highest rank of painting... Friends will mourn the loss of an amiable young man, who upright character commanded general esteem, for honour and art do not always go together". Michael Sadleir considered Lightfoot's early death "a disaster to art in England." In terms of quantity, of variety of production, and increasing maturity of style, 1910 was the most important year of the artist's short life. From this year date the slightly macabre sepia illustrations which, with their emotional overtones, their mannerisms approaching the grotesque, and their strong chiaroscuro, are close to the works by his friend, Stanley Spencer.... Many of Lightfoot's numerous tree studies, probably also of this year and done in the same brown ink medium, also have a sinister quality in the way the dark trees are silhouetted, despite being pure landscapes. Lightfoot's powerful drawings suggest that, unlike his fellow "wonders" he is going to compromise with the past. His two oil pictures are carried further in the old-fashioned sense than anything in the gallery. He is obviously not going to remain satisfied with the light, rather precarious painting of the Camden Town Group. 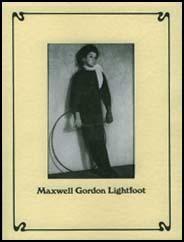 Without any undue or dangerous precocity Lightfoot had mastered his medium. He had little in common either with the sentiment or the peculiar methods of the Camden Town Group; indeed it was a matter of general surprise that he should be showing his work with theirs... His nervous draughtsman and rich palette are more characteristic in believing that Lightfoot would enjoy a most distinguished career in the highest ranks of painting. He was very fastidious, and destroyed a good deal of his work. But Professor Sadler and other collectors have fortunately excellent examples of it. The greatest sympathy will be extended to his bereaved relatives. Friends will mourn the loss of an amiable young man, who upright character commanded general esteem, for honour and art do not always go together.